José Rivas of Mexico, a student in the Master of Professional Studies in Geodesign program at Penn State, gives a presentation using his avatar and a simulated laser pointer. 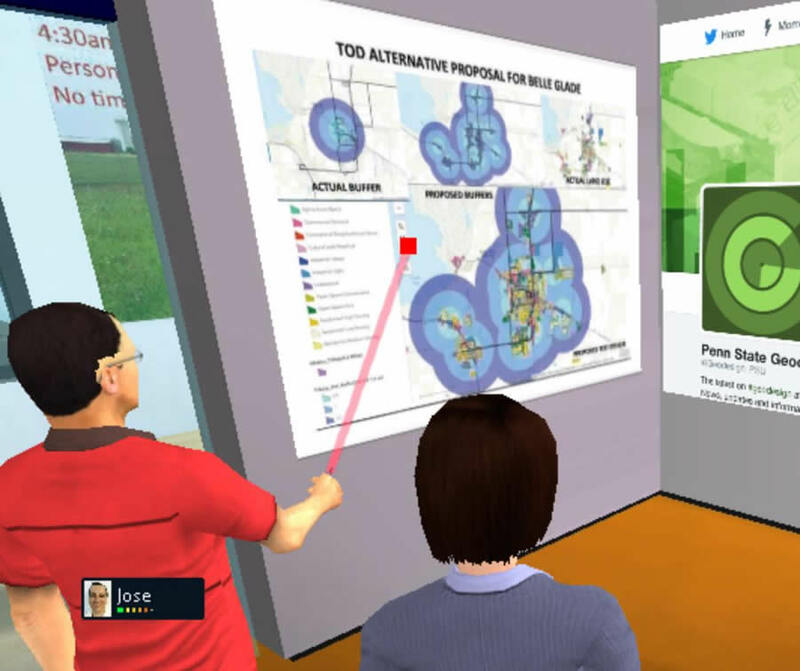 The student avatar in the blue shirt stood in a virtual classroom, flanked by faculty and fellow student avatars. He focused a red laser simulator at a digital map of Lee County, Florida, pointing out where land could be developed near mass transit and urban services in order to reduce development in areas that may be better suited to agriculture. “Don’t take anybody’s eye out now,” joked a faculty avatar. 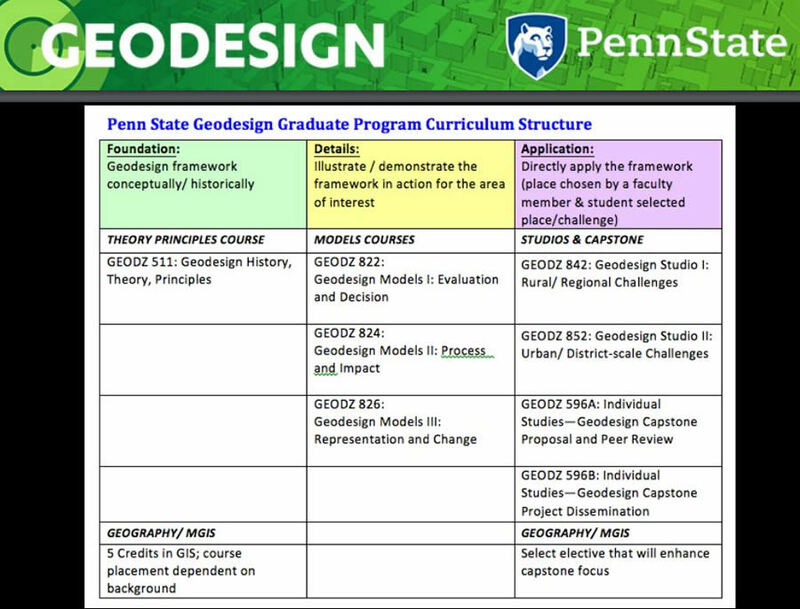 Welcome to the cloud-based environment for teaching geodesign at the Pennsylvania State University (Penn State) World Campus, where students learn to make what the university calls “geospatially oriented” design decisions. Students can earn either a 35-credit Master of Professional Studies in Geodesign degree or a 14-credit Graduate Certificate in Geodesign online, collaborating on assignments and making final presentations to faculty and classmates in a 2D/3D virtual classroom, such as Terf. Students and faculty also communicate using other Internet-based communication tools such as Skype and Yammer. It’s the next best thing to being together in one room. Penn State's online geodesign graduate programs are housed in the Stuckeman School of Architecture and Landscape Architecture. The programs are offered in collaboration with the university's Geography Department's Master of Geographic Information Systems program. Kelleann Foster heads up the geodesign education program at Penn State. In its broadest sense, geodesign [PDF] combines the art of design with the science of geography. Using stakeholder input, creative design techniques, rigorous methodologies, and spatial analysis and mapping, a geodesign practitioner can find the most suitable, environmentally friendly, and sustainable options for how to use space. That may be space for development, agriculture, wildlife conservation, transportation or flood control systems, marine protected areas, and so on. The geodesign technologies used in these programs, including Esri ArcGIS for Desktop, GeoPlanner for ArcGIS, and ArcGIS Online, help students analyze data and then visualize the impacts of their designs. Interest in geodesign has spiked in the last several years. 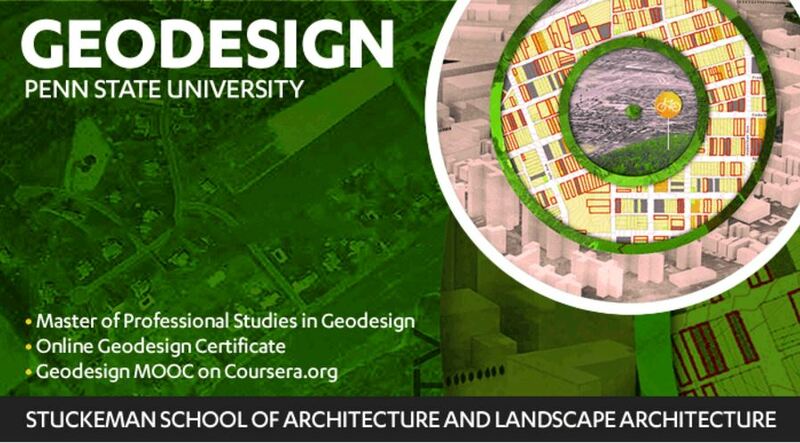 This is evidenced by more schools like Penn State offering geodesign degrees or certificates, including the University of Southern California (USC) and the University of Wisconsin, Madison. 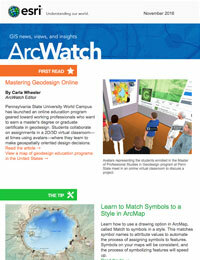 (View a map of where some of the geodesign education programs are being offered in the United States.) Also, the Geodesign Summit, held once a year at Esri headquarters in Redlands, California, attracts hundreds of people, and the annual Geodesign Summit Europe also is well attended. 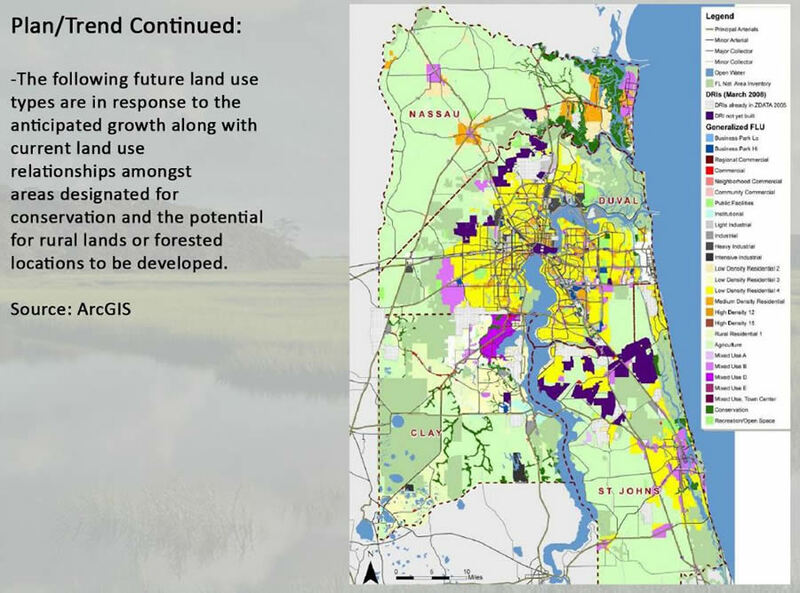 A geodesign student selected a region in northeast Florida for his study site due to its unique mixture of land uses and projected growth. This surge in interest is due, in part, to concern about the effects of climate change, such as sea level rise and drought; limited availability of land for development; the need to protect environmentally sensitive areas; and a desire to launch mass transit projects such as passenger rail service to reduce the carbon footprint. Issues like these are spurring more communities and organizations to plan smartly and sustainably. Geodesign is about trying to make sense out of what is often a huge amount of data related to a planning issue—asking a lot of key questions, creating multiple design iterations, and testing them before reaching a consensus with stakeholders about which solution to implement. Land tenure, or ownership, is one of the key factors the students considered in their studio that focused on landscape and regional issues in geodesign. The challenges are many. And the students get to dive in and work on scenarios based on real-world issues that cry out for creative, thoughtful, and scientifically sound geodesign solutions. Recent class assignments have included deciding where to place transit-oriented development (TOD) in Florida and evaluating alternative routes and plans for improving US Highway 64/Corridor K in the Ocoee River Gorge area of Tennessee. The students use GIS to evaluate their design scenarios. For example, master’s degree student Shannon McElvaney used modeling and analysis tools in ArcGIS for Desktop, ArcGIS Online, and GeoPlanner for ArcGIS to analyze where to locate TOD in Miami-Dade County, Florida, in 2040, taking into account 330,000 households that the county projects will need to be added by then and the probability of a higher sea level. 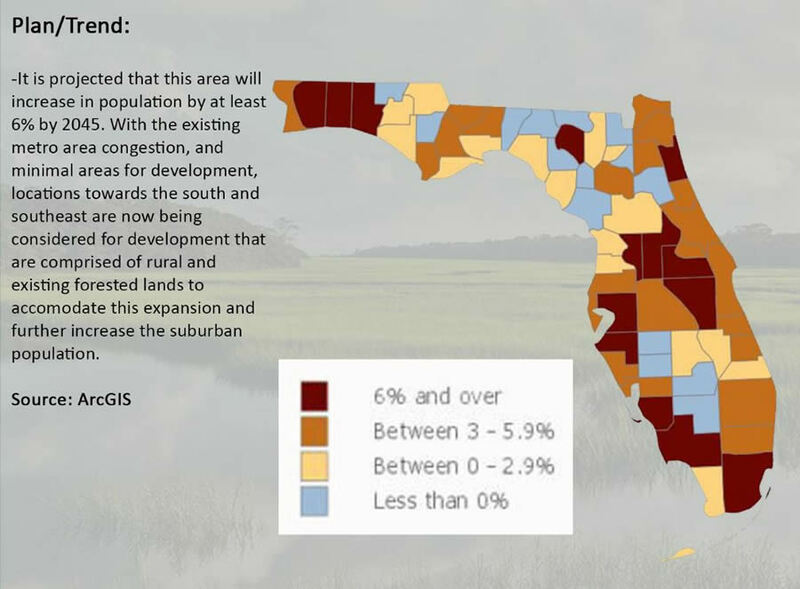 For that assignment, Penn State faculty member Michael Flaxman, who taught the master’s degree course Geodesign Studio I: Rural/Regional Challenges, stipulated that the students create TOD proposals for various areas of Florida. “[TOD means] the placement of residential and mixed-use development that decreases the total vehicle miles driven and increases the use of public transit,” said Flaxman. The question was, “where can we grow?” said McElvaney. He had to factor in many constraints, including protecting green infrastructure and accounting for sea level rise that is projected to leave some areas near the coastline and even some land inland unsuitable for development. Students earning a Graduate Certificate in Geodesign and a Master of Professional Studies in Geodesign take foundational courses first and then learn about Carl Steinitz's geodesign models. Master's degree students also participate in studios in which they complete three-hands on, applied projects using the full geodesign framework process. Using sea level rise projections that The Nature Conservancy provides online, McElvaney brought that data into GeoPlanner for ArcGIS and mapped it. The map he created showed the land in his study area that would be covered by water in the future due to a projected three-foot rise in sea level. The lavender color on his map represented land that would have a 75 to 100 percent chance of being three feet under water, meaning big trouble for portions of Miami Beach and a military base to the south. McElvaney finally decided it would be smarter to develop a bus rapid transit (BRT) system farther inland and create mixed-use development along that route rather than putting in a fixed rail system that may be threatened by the rising sea level. “I love fixed rail, but it’s going to be dangerous to invest money in it along the coast,” he said. Flaxman said he was impressed with the work done by McElvaney and the other students in the class. “The primary [objective] was to become comfortable with large problems and large spatial scales,” said Flaxman, who also has taught at Massachusetts Institute of Technology (MIT) and owns Geodesign Technologies Inc. in Berkeley, California. The students, Flaxman said, had to understand their assigned regions’ plans and trends and then strategically intervene to improve the plans. “They came up with some good design solutions that faculty wouldn’t have thought of,” Flaxman said. Student Shannon McElvaney studied where 330,000 households could be accommodated in the future in growing Miami-Dade County, Florida. McElvaney used Esri GeoPlanner for ArcGIS to analyze different scenarios. In scenario A, he tried to put most new development in areas conducive to transit oriented development. "By picking areas along routes of high traffic and high intensity land use, we were able to sketch in about 165,000 households," he said. In scenario C, sea level rise was considered. That factor eliminated some coastal development and added more development inland, resulting in 206,000 households being accommodated. One of the required textbooks in Penn State’s geodesign program is A Framework for Geodesign: Changing Geography by Design, authored by Carl Steinitz, professor emeritus of landscape architecture and planning at the Harvard Graduate School of Design, and published by Esri. Steinitz’s framework for the geodesign process is shaped by a set of six key questions: How should the landscape/study area be described? How does the landscape/study area function? Is the current landscape/study area working well? How might the landscape/study area be altered? What difference might the changes cause? How should the landscape/study area be changed? 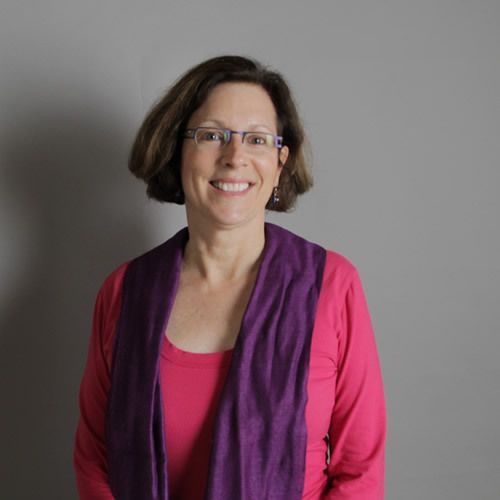 Foster said she was inspired to start the geodesign program after seeing Steinitz’s geodesign framework in action when he was a visiting professor, serving as Penn State’s Eleanor R. Stuckeman chair of design in the fall of 2011. He taught a geodesign studio, and Foster said she was impressed with how well the process worked. According to Steinitz, those affected by any proposed design change—he calls them “the people of the place”—should have input in the process. 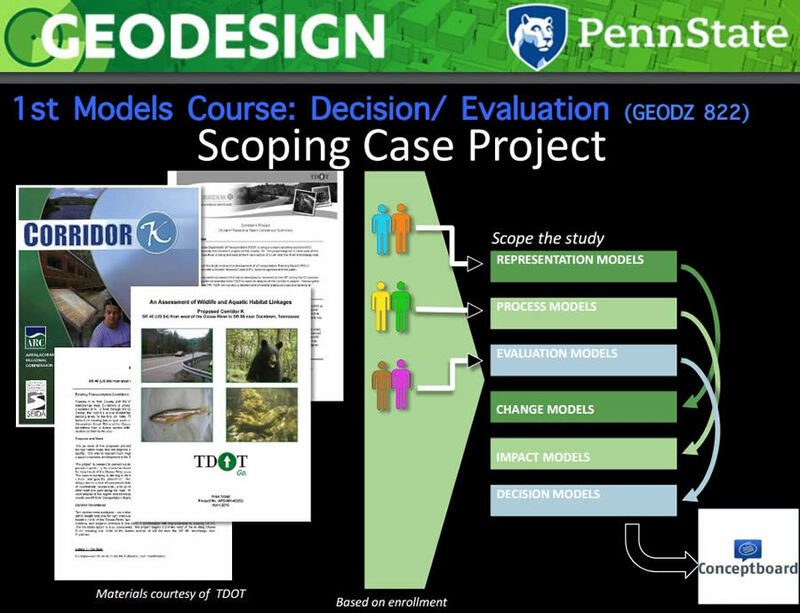 That’s what the Penn State students learn how to do in another course, Geodesign Models I: Evaluation and Decision. Students in that class are asked to tackle another real-world conundrum involving a portion of Corridor K, a proposal to improve the highway system that stretches from Cleveland, Tennessee, to Dillsboro, North Carolina. Officials are weighing several design alternatives as they try to meet transportation needs while protecting an environmentally sensitive area called the Ocoee River Gorge. McElvaney mapped areas of south Florida that were potentially vulnerable to sea level rise using data available through The Nature Conservancy. The areas in lavender have a 75 to 100 percent likelihood to be under three feet of water in the future, he said. The orange areas show land that has a 24 to 75 percent likelihood of being under three feet of water. While evaluating the different route options (which includes building a six-mile tunnel under the Cherokee National Forest), each student takes on the persona of a stakeholder such as a trucker and a hiker, states opinions about the alternatives, and then negotiates, said Meehan. In this way, the students learn how to include the people of the place in the design process. In Penn State's GEODZ 822 course, students learn how to determine the design method to use by defining how decisions are made, and by whom, and what evaluations are necessary to make informed decisions. Last spring, the students studied a transportation project called Corridor K in Tennessee. Both the certificate and master’s degree programs require geography courses as needed, along with classes on geodesign history, theory, principles, and models. The master’s degree students also take Geodesign Studio I and II and complete a capstone experience that involves preparing a student-selected, peer-reviewed geodesign project and then either present it in a formal venue such as a conference or author an article about it for a professional publication. The days of working in a vacuum on a design project without collaborating with the public, decision-makers, and experts in other fields are long gone. For more information about the Penn State Master of Professional Studies in Geodesign and Graduate Certificate in Geodesign programs, visit worldcampus.psu.edu/geodesign or contact Kelleann Foster at geodesign@psu.edu. Foster also will be available to answer questions during the Geodesign Summit, which will be held January 24 to 26, 2017, in Redlands, California. She will be a featured speaker at the summit.